Rather than my usual policy of being a tease, l thought l would start with the quilt I have had the most questions about. Seneca. 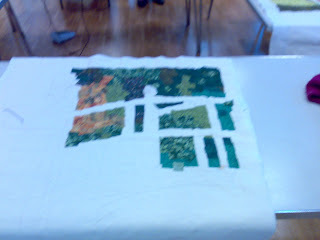 This is the quilt I was working on at the beginning of the year that I had hoped to enter in the Veldhoven show. Sadly things happened and it wasn't finished in time. 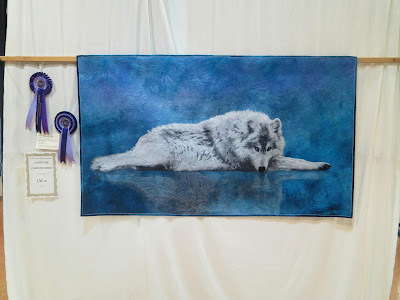 l did however get it done for Sandown, where it was in the large wallhanging category. 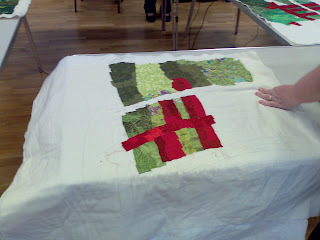 The quilt is raw edge applique with a lot of thread painting. The background fabric is another piece by Heide Stoll-Webber. I think it was one of my pot luck pieces. By which l mean the pieces l buy part way through the Festival Of QuiIts when l am not really thinking too well. 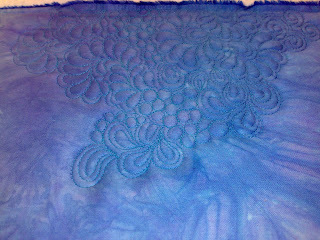 I tend to get some very pretty fabric that way but l usually have no idea what l am going to do with them. The fabrics in the wolf were bought in Houston last year. Again I had no idea what I wanted them for but they were too good to miss. l ended up having to order more to be sure I could finish this quilt. Of course l now have loads left over. 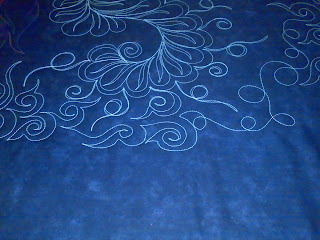 l struggled to find a quilting design that l liked for the background So in the end l used a combination a several patterns. I like the result so I expect l will do this again. For those who have asked why I don't blog as much, it is largely because blogger has become very difficult to use. To produce this blog post has taken 2 computers and 3 pieces of software to say nothing of 2 hours of my time. Yes I know that is crazy, but well that seems to be what is required now. It does rather put me off blogging. I do have things I would love to be sharing with you but how? Ok that seems to work. Guess l had better try to get some photos then. 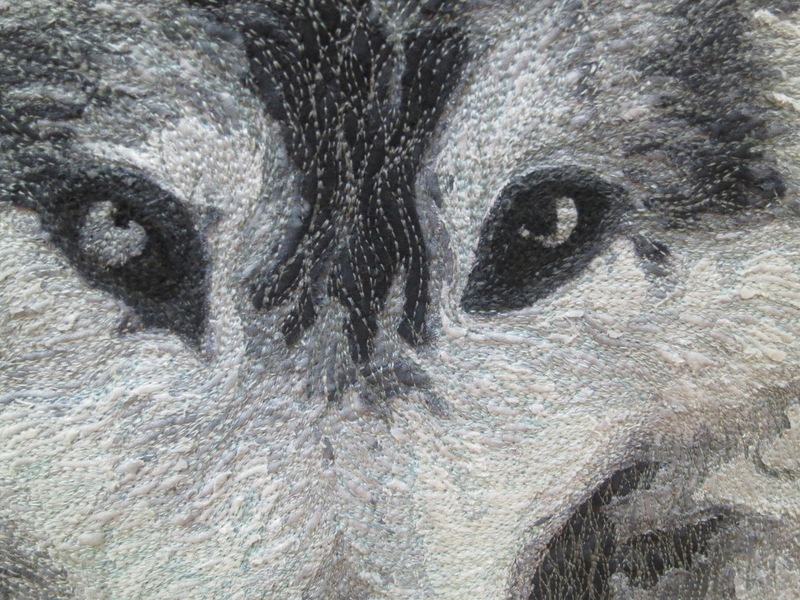 If anyone has any pictures of my quilts at Look Lomond could you send me them please then \ can write about the show. I forgot to take my camera with me. Sandown l do have pictures of l just have to work out how to get them on here. Well here is anther way for me to try and get back into blogging. l am hoping a new google approved device will help but only time will tell. I know a lot of you hone missed my ramblings and to be honest I have missed you too. Unfortunately the new improved blogger has been horrible for me to work with . Since my last post a lot has been going on . l hone exhibited in Scotland and at Sandown , taught many classes and done several talks. Fixing my blog has been fairly low priority. If this works that may be a thing of the past. I heard somewhere that it takes 100 hours to train you first machin and something like 80 to train your second. I guess that the time I've spent on other peoples machines had helped as this on is shaping up much quickker than that, though I do wonder who is training who. My tension still wasn't great but I have that sussed now, I needed to relearn how to adjust tensions. My principles were right but my technique sucked. 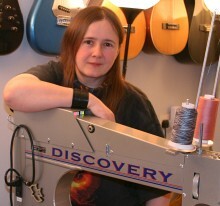 Oddly these machines seem to actively like metalic thread, I wasn't just being mean. I've truied to include the machine is some of the pictures so you can admire the blackness of it. I think it looks fantastic. 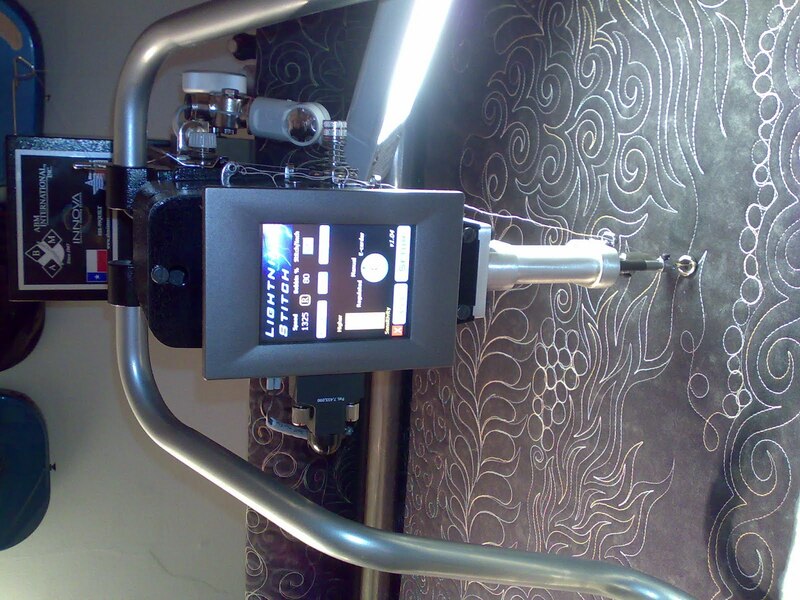 The really observant will spot that the machine has a stitch regulator. No it wasn't something I wanted, but I did want the better motor that comes along with it. 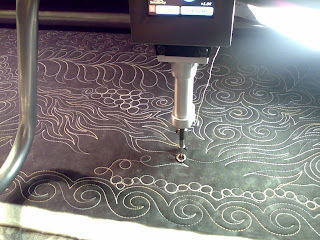 The speed with which the machine starts and stops is just amazing. It's taken me a while to post these but this is my first play piece on my new machine. Don't look too closely, I hadn't got the tension figured out or the wheels set right yet, but I had to play. It's so much fun having a new toy and the ABM Innova family is amazingly welcoming. Sunday I spent the day in Worthing teachin impressionist art quilts. 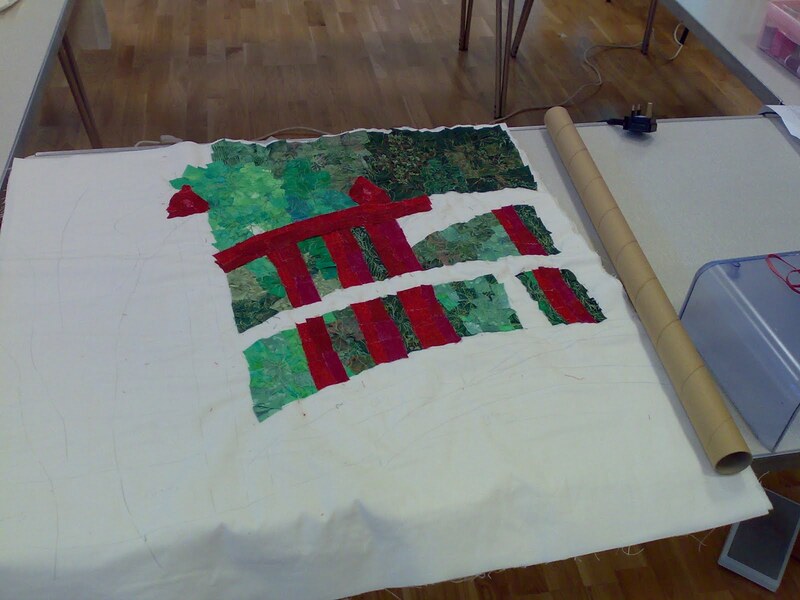 The class is based on my quilt 'In full bloom'. 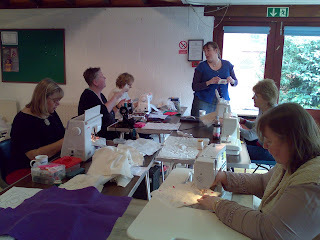 I supply a pattern to get people started and during the day teach them how to make their own patterns from photographs. As with all my art quilts there is no drawing skill required just the ability to not take yourself too seriously. It's a great venue and I hope everyone had fun, certainly there is a lot of very promising work going on. Yes it would be easier without the cat. 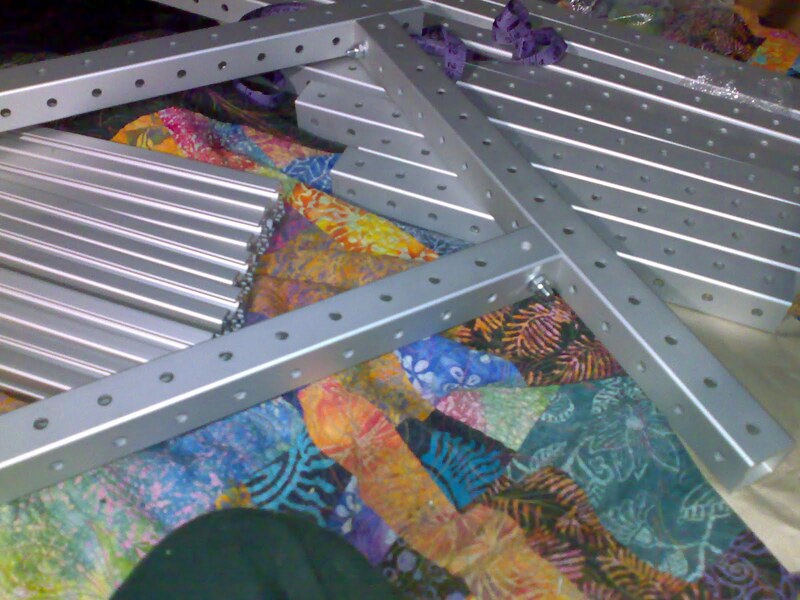 Is this grown up meccano or what. I am loving this. I know you aren't supposed to admit this but the truth is my life has been quite boring to the last few weeks. There has been paperwork accounts and tax returns. House work and planning but not much of interest to quilter, well not unless the cleanliness of my toilet is interesting, sparkling ;) I am now back clearing some customer work before getting onto my next show quilt. The picture is one of those. 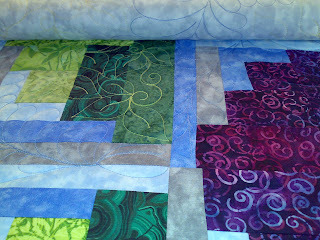 This was an intersting quilt for me to do as it needed a cheaper version of the quilting I put on the last one I did. I was lucky enought to quilt a show quilt last year for Jenny at Patchwork Corner and this is the same as that. I am pleased that it has the feel of the original and I hope the customer will agree. 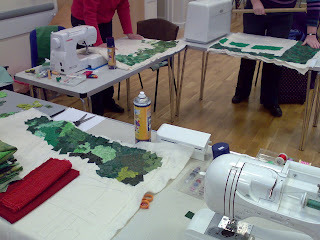 Tonight I am giving a talk to Amwell Quilters. I just hope the snow stays at a minimum and they make it there. I aught to get back to driving, but I thought it would be good to show I hadn't forgotten you all. 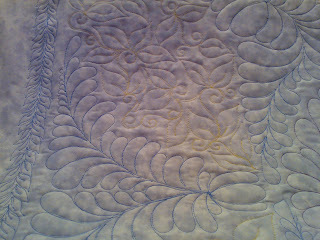 Here is a section of todays quilting on the applique. 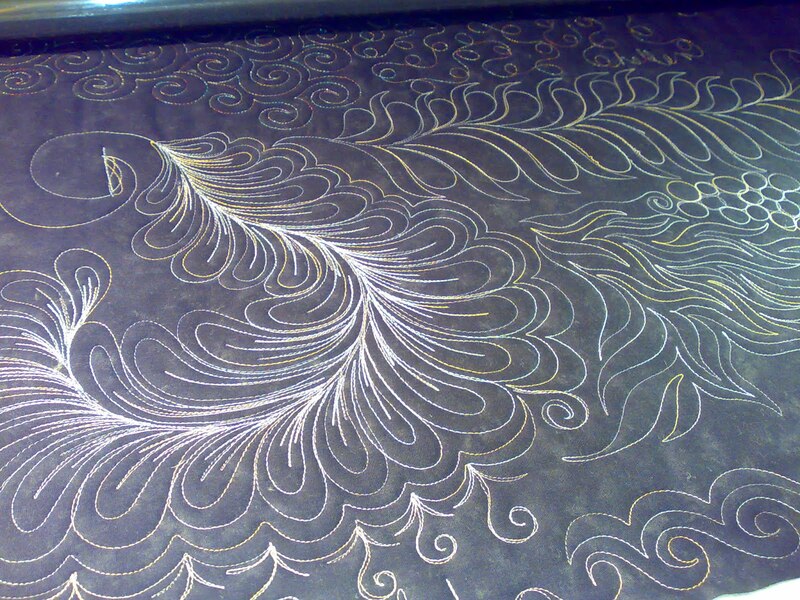 As you can see it is taking a lot of thread changes to blend properly, but it's fun. 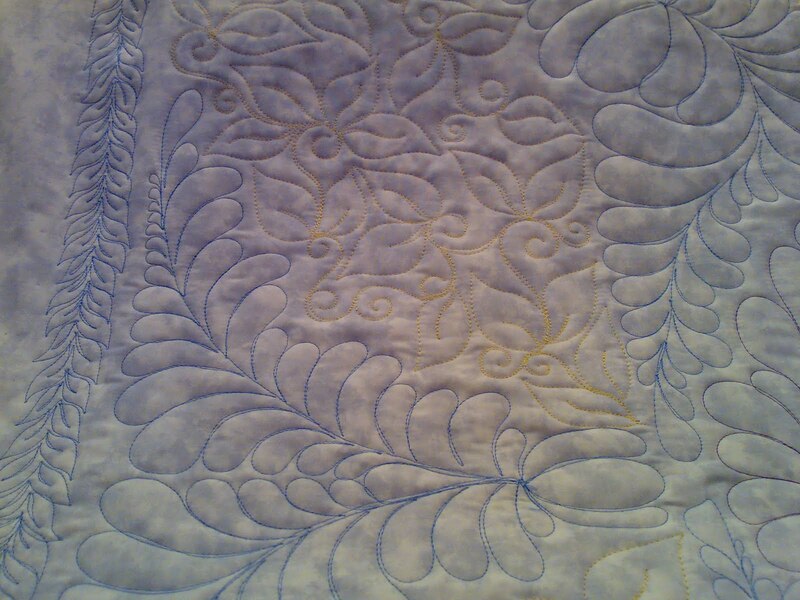 I think I might get all the applique quilted by the end of tomorrow, but who knows. 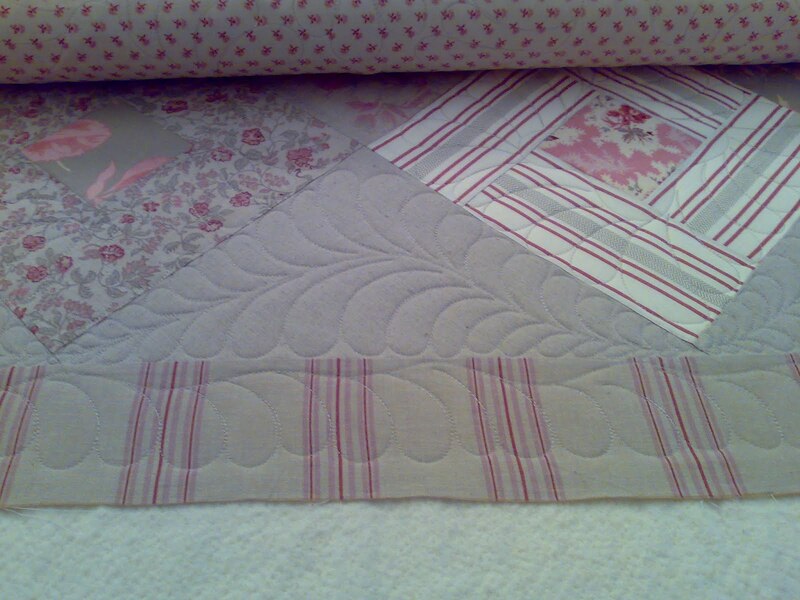 I've finally got the applique onto my new quilt. It's taken 2 weeks solid work to doit and my hand doesn't love me. 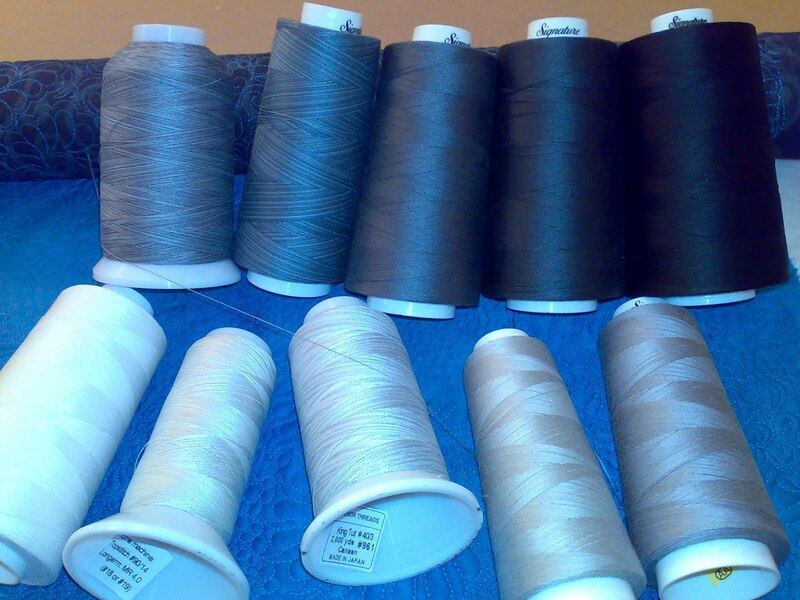 Now I have to quilt it and that means another large selection of threads. These are actually a lot more grey than they look and as they are all I have in the range I just hope they are enough. I already suspect the pale is too pale which makes things tricky. I guess I will do what I can and if I have to resort to cunning tricks so be it. 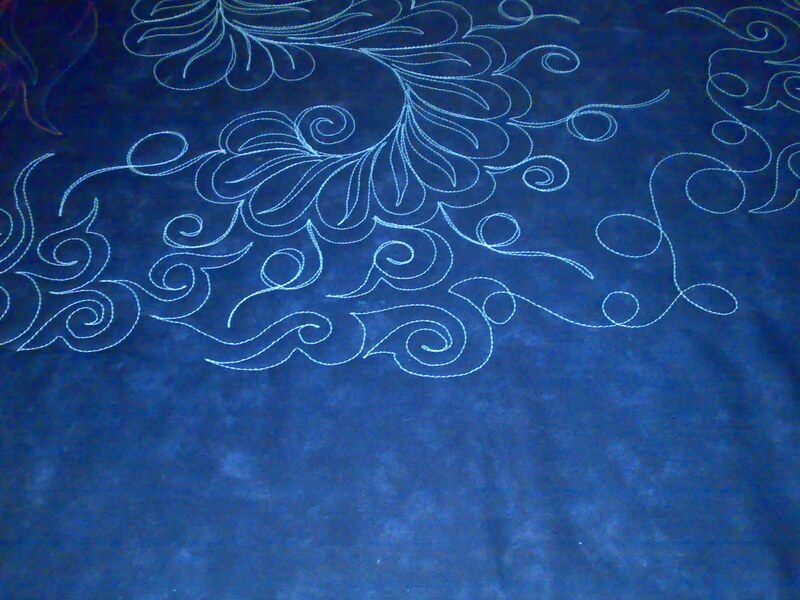 I wasn't sure how the background quilting was going to work. I wanted shading but I wanted that to be subtle and I needed the background to be interesting as there is a lot of it. This is the design I've settled on. Well the selection of designs actually. I don't see me ading many more different designs as I want this to be the background and not grab too much attention but at least it's got a bit of life to it. 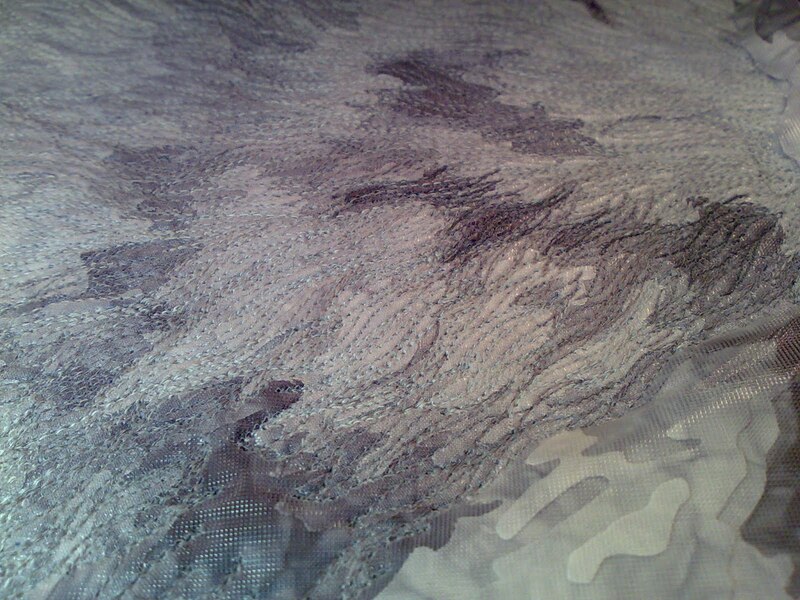 There will be seven different threads in the upper area of the background and I think eight different ones in the lower area. You know me though, this could change before I get that far. I've finally got my own project onto the frame. 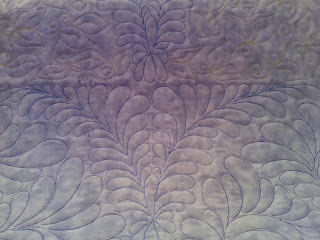 It's based on a piece of hand dyed sateen, by Heide Stoll-Weber. 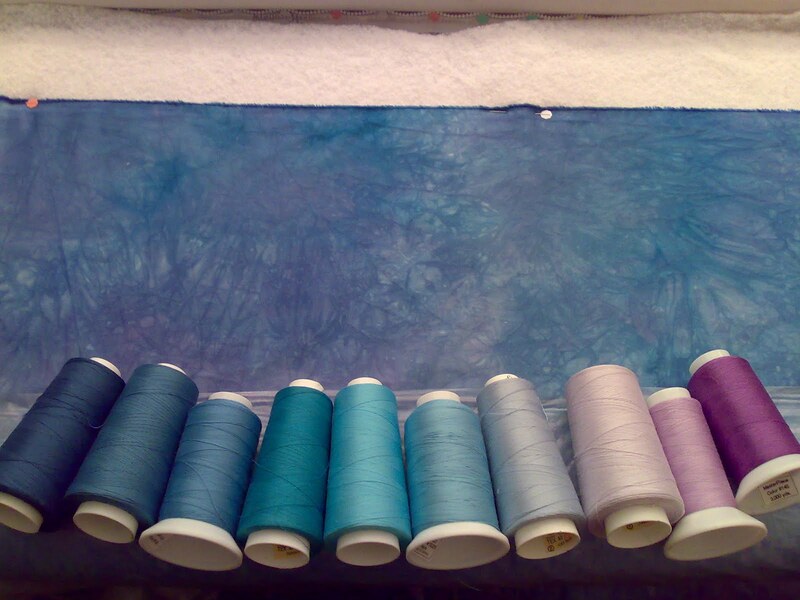 These are the threads I will be using (probably) for quilting the first background area. I have mostly picked threada that tone in with the background but for the look I am after I want to be able to do some shading hence lots of threads. 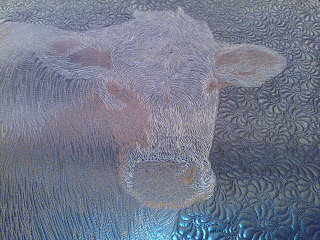 I thought you might like to see the front of the finished cow head. 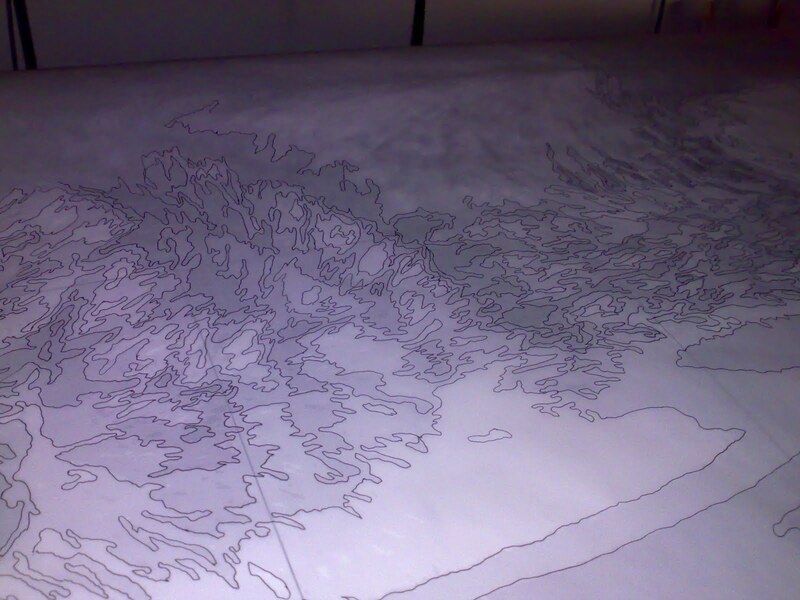 This is it pinned out on a thick piece of polysyrene to keep it flat while it dries. As I mentioned before I didn't wash out all the stabiliser so it is going to be a little stiff, but I think that might also mean it hangs really well. It will be interesting to see. For now it's just going to stay where it is. It's quite safe there and I can get on with other things. 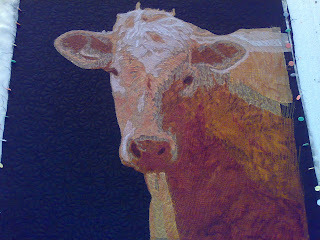 I thought you might like to see the quilting on the cow head. It's always easier to see from the back, but the washaway stabilizer makes it even clearer. 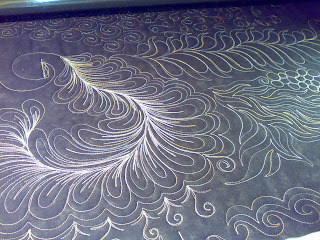 The background quilting is black on black and will be very hard to see when it's finished. The quilt has now had a bath and is pinned out drying. 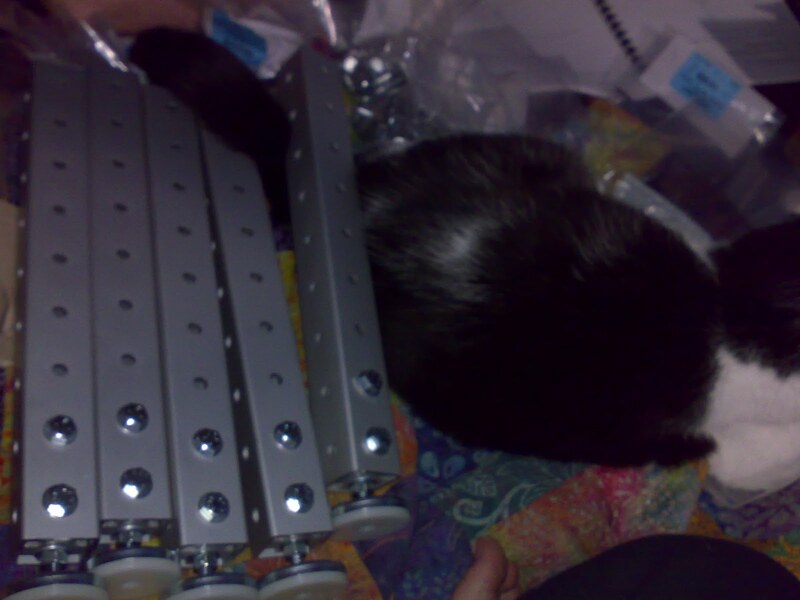 I deliberately didn't get all the stabilizer off. I thought being a bit stiff would help in class, both with me holding it up and with the amount of handling it will get. Of course it may also cause other problems but I won't know until I try. When I was in Houston I bought two sets of rulers from Dusty and folks asked if I would put up a review of them when I had tried them. I have now, so here goes. Firstly the cute packaging is also useful. I can hang the bags from their drawstrings and keep a whole set on one hook, neat. I am also using them for storing my cunning pin catchers but more on those another day. The set I have spent most time with are the radical rulers. Their first outing was a baby quilt for a regular customer. She doesn't mind if I play and a baby won't critique my quilting. I used the 4 way cross shaped ruler to do the borders, with the gothic arch look. 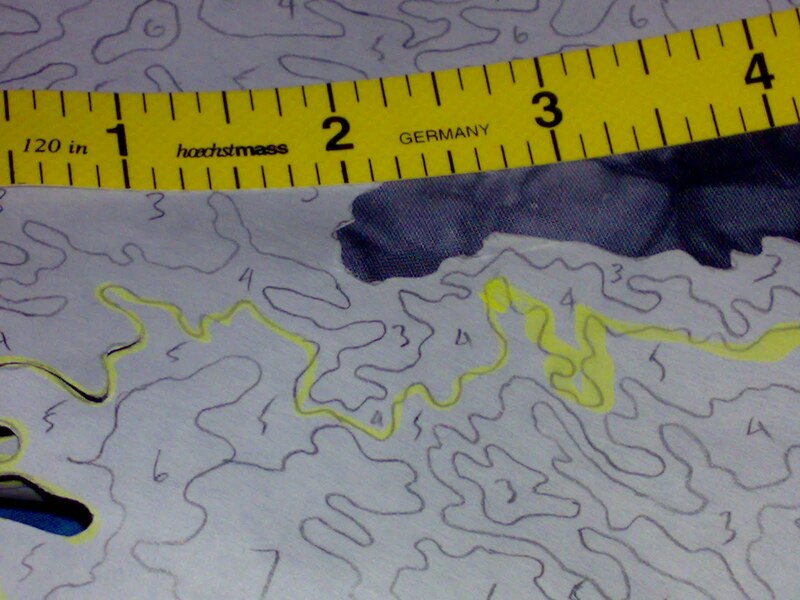 It wasn't perfect, I don't use rulers much so that is to be expected but it was acceptable. If you look on you tube you will find some video of him demonstrating them and the border I tried was one he shows. I did find the ruler a lot easier to hold than most I've tried. It's a really good size, big enough to be usefull small enough to he held stable easily. I then had to quilt Tet's Christmas present to his mum. 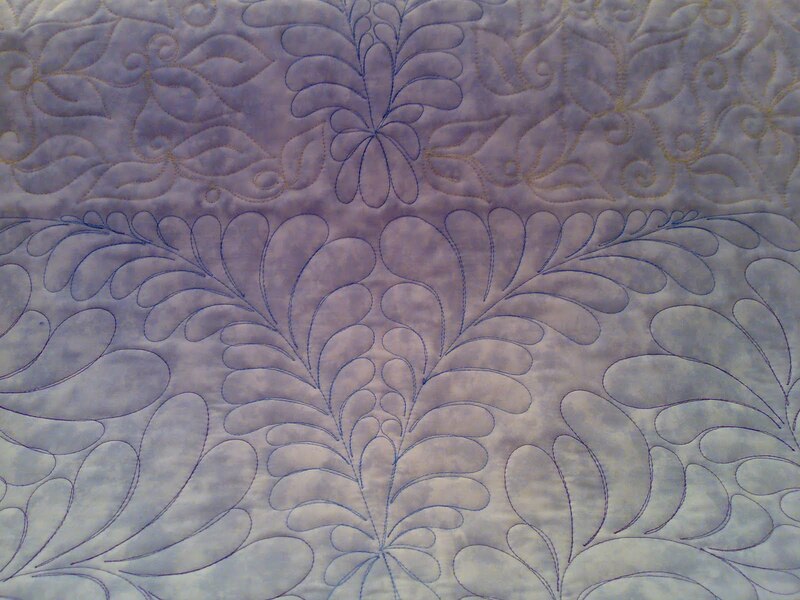 It has a lot of applique on it that had to be stitched around. I grabbed my trusty straight ruler and the went hunting for something to use on the curves. Three of the radical rulers got pressed into service. The two arches and the 4 way. Between them they had something close to every arc I needed and were all easy to hold. It wasn't what they were designed for, but they are very very good at it. So much so I've done tons of stitch in the ditch (something I normally won't do) on two sampler quilts as well. I still need more time to play with the rulers and the other set I bought, but so far I am a very happy camper. These have changed the way I look at ruler work completely. I've also started using my leader grip side clamps. They are much easier to open and close than I had expected, which is good and I love the way the hold the backing. The leader grips for loading quilts are waiting to go on the new frame when it arrives, which will be a while yet because I wanted it customising. I know, typical, but hey if you are going to spend that much you might as well get it right. As you can see I am making good progress with the cow now. Yes this does mean the tracing is all done. I am so relieved, it was getting really boring. 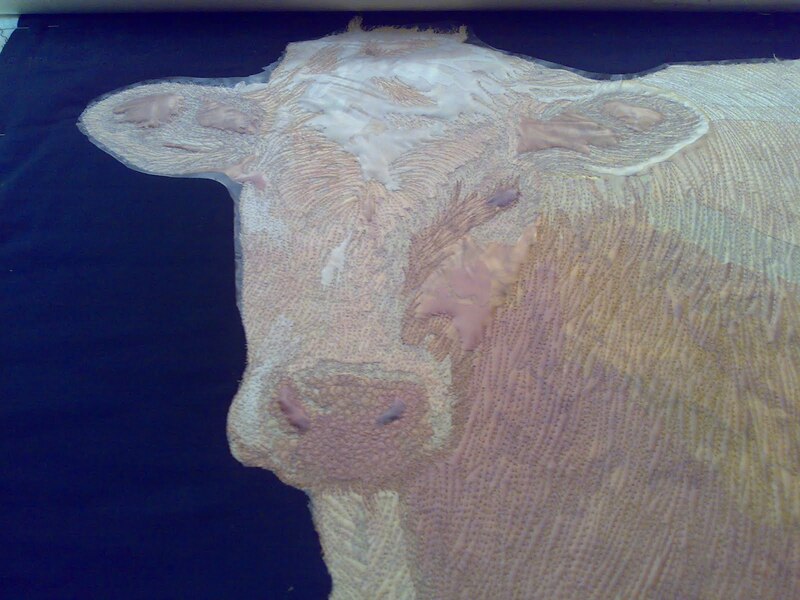 The cow has been about for nearly a year without quilting. 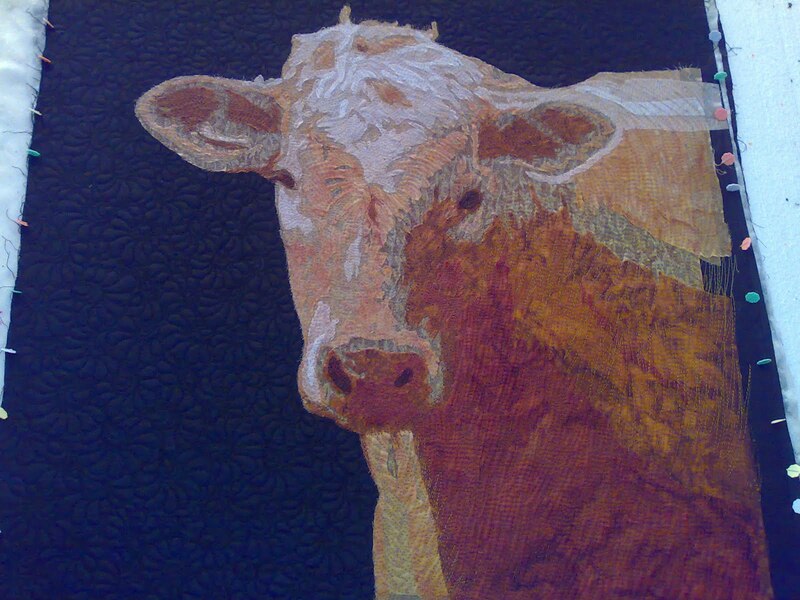 It is one of the samples for my art quilts 3 class and is based on the photos I took for Herd Mentality. 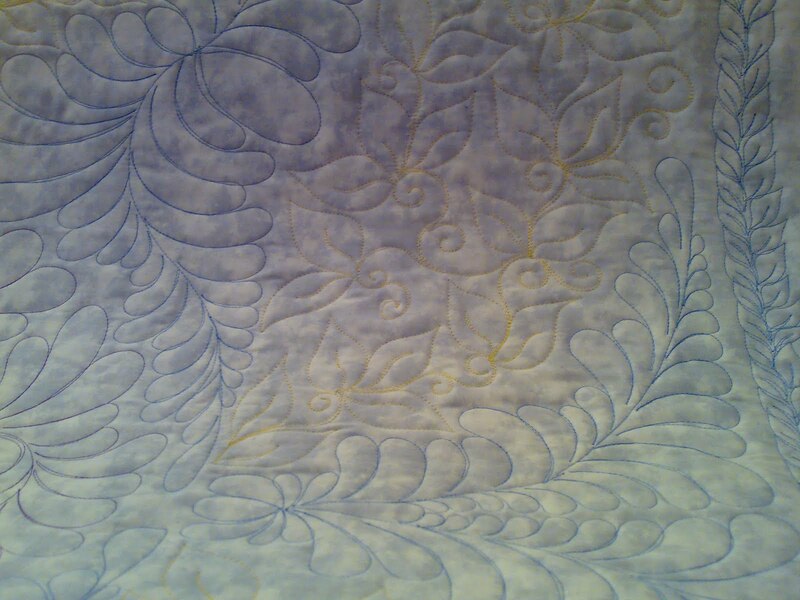 It is quilted very differently from Herd Mentality, and is also acting as a test for my next quilt. 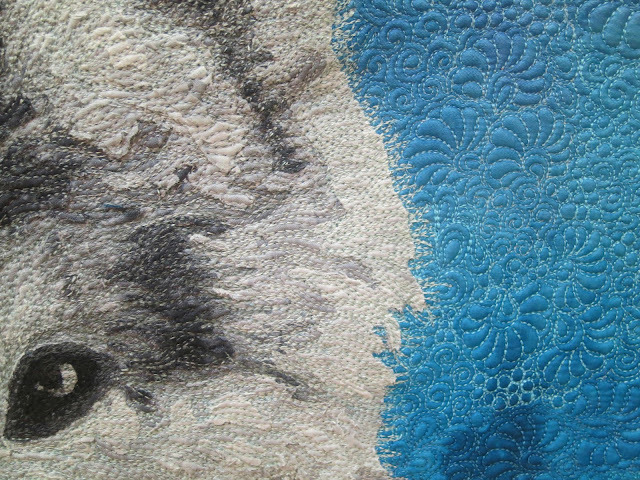 Fur goes much faster than I expected and is a lot of fun to quilt. Well, two things actually. I know that's a bit odd bit when I need a long table I lay a piece of polystyrene on the rollers. 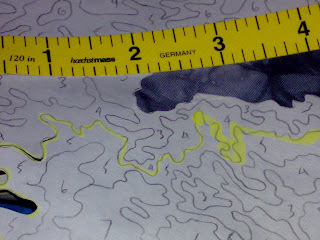 At the moment I am using that to trace a pattern. The picture shows part of round 1, I'm on round 2 now, and for this project there will be a round 3, though 2 and 3 are only partial tracings so it's not as bad as it sounds. Actually mounted on the frame I have my cow head sample quilt. I finally got fed up with the pins at a time when the frame was free so the pins are out and the stitching is going on. I made it from the exact requirements I give students which meant the backing was too small to mount so I mounted heavy weight washaway instead. 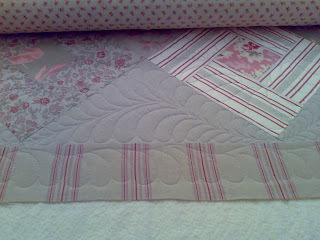 I am not enjoying quilting a quilt with a lot of layers of fabric and the thick washaway front and back. I won't be making a habit of this. No I haven't been taking time off from quilting over the holiday. Did you really think I would? Yesterday I finished off a customer quilt the loaded this little one. It's a sample for one of my patterns so I will show you it when the patter comes out, but for now I can at least show you the back. It's not the most exciting quilting in the world. It needed to be quick and easy and done. Loving having access to my blog again. Hopefully this new phone will let me start blogging again. I can't get the new blogger software to do what I want and my handset got too old and shaky to deal with email or web access. So for my present to myself I got a replacement handset. 2 days to get things synced and I seem to be back up and running. 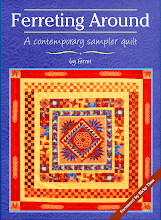 The quilt is a sample for a pattern. 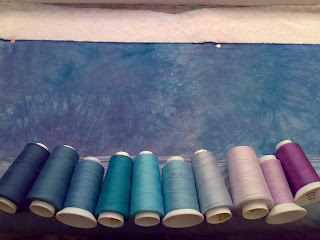 It's just keeping me out of trouble until I can start on a new art quilt. Just waiting to get the new printer up and running.